Weight Extremes What’s your Look? Firstly we think women of all heights should want to be healthy and fit and most of all too be happy with yourself! Perfect examples of healthy, thin, fit and curvy are famous petite women Salma Hayek (5’2″), to Rooney Mara (5’3″) and Raquel Welch (5’4″). Unfortunately, exercising common sense and good judgement doesn’t seem to exist for some women when it comes to their body weight. Obviously, we live in a world of weight extremes. Isn’t it time that we all learned that being overweight, or anorexic isn’t healthy or attractive for anyone? Many fashion magazines promote fashion models to be stick thin. Most of us agree it is just not normal to see a 5’9 woman who is photoshopped to having zero proportions and then see them as the ideal woman (see Ralph Lauren ad to the left). Clothing designer’s and Vogue magazine are directly at fault for this look. I recall a close friend who was a glamazon fashion model telling me how terrible it was to be a working runway and print model, because essentially you must be terribly thin (anorexic looking) and to get that way it’s nearly impossible to be healthy and to eat right. The story of a fashion model goes something like this… My BFF Cyndy was discovered by ELITE model agency and flown to Paris a week later. It was great, until I realized that I lost my roommate and best girlfriend to Parisian fashion world! In fact, she never came home to California and she was swept off into a career in high-fashion. Long story short, Cyndy was 5’10” and thin framed, skinnier than most. She was the typical fashion model type with red hair and all (like Nicole who won ANTM ‘shorty’ season shown in photo to the right). While in Paris, Cyndy was constantly hounded about her weight by top fashion designers who felt she was “over weight”. She began losing jobs, because she could not reach an unhealthy weight and they wanted her at 5’10” to become a size 2 or 4 for clothing. The lesson here is that you shouldn’t put your body through unreasonable and unhealthy processes to be a model, it’s simply not worth it. Cyndy decided to quit the modeling business and instead married a famous tennis coach. Today she lives in a New Zealand coastline mansion… and she claims she doesn’t miss the model life. Then we have the other extreme in the weight spectrum, “over weight” like Jessica Simpson, Kim Kardashian, Kirstie Alley and Queen Latifiah. These women are beautiful, but it seems they have become part of the 30% of our population that is obese and or severely overweight. Many magazines, like GLAMOUR, have tried to promote size 12 plus women as being acceptable and the new real women. The term “full-figured or plus-sized” is an attempt towards politically correctness. , On another note, the reason there’s so little clothing designers willing to design fashionable full figured wear (size 12 plus) it’s due to the fact it’s extremely costly. The fabric, the grading etc. is just too expensive too make the clothes. In respect to petite clothing, the designers believe petite women are fine footing an additional alterations bill to size down. So it seems there’s no happy medium here. The best thing for all of us ladies is not to go for the extreme “fashion model” skinny, celebrity anorexic, or oversized looks. It’s going to be difficult which ever way you go. A nice medium is somewhere in between, too skinny, curvy, or fat… be happy with your clothing size, don’t blame anyone for your size and embrace it! Bella Petite Magazine is Fashion, Entertainment and LifeStyle for Women 5’5″ Tall & under. 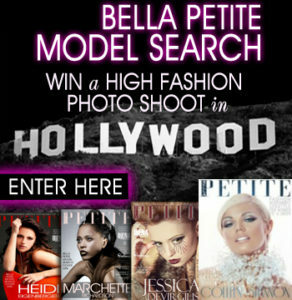 BELLA PETITE MAGAZINE Enter the Bella Petite Model Search. WIN an all expense paid photo shoot, high fashion spread and tearsheets for your portfolio, modeling promotions and editorial coverage! Check out our exclusive models column for features on Bella Petite Models. Next Men Prefer Petites Scientific Study Reveals! I believe that many girls go to extremes that aren't healthy. It's awful seeing girls that are extremely tall and thin or reaaly obese. I want to see more petite models in the world. even plus sized models would be great. I'm rtired of all these rail-thin super-tall girls!! You know what screw you. I have been dieting for months now and have just gotten to a size 12. No I didn't get fat in the first place from eating too many burgers. I was diagnosed with Systemic Lupus, put on medications that made me gain 50 pounds, and have arthritis so severe that I can barely walk some days. So yea I guess I'm not exercising enough for your taste. I was just starting to feel good about myself again and then I found this article. I know this was supposed to be some form of female empowerment, but it's not for all the people like me whose weight problems aren't because of lack of self control. Dear Ally… I am very sorry to hear about your condition. There is no question that individuals suffer from a variety of unique circumstances which affect our ability to achieve a certain body image or type. The post was certainly not meant to be insulting or an indictment of individual conditions. Actually, it was only meant to comment on the extreme body images presented in our popular culture, including the fashion and entertainment worlds, which often concentrate and even glamorize both ends of the body type spectrum. As mentioned in the post, I only hope for women to be happy and healthy. This is the goal and there are many different paths to achieving this goal. I wish you the best with your struggle and thanks for the comment. "Curvy, gross skinny or fat… be happy with what you choose and don’t blame the magazines. You make your own reality!" I completely agree with this statement. People constantly complain about this. You make your oWN choices, sont blame other people for your own weight! It is your body and the only person who can change it is you. Many of my taller friends complain to me about how they MUST be fat because they weigh more than me, Even though they are tiny! Taller people are naturally going to weigh more because the have bigger bones, and bones and muscle weigh more than fat. You can not judge your own health and weight by other peoples appearance or numbers, you have to go by what is healthy for your size, and if you are not sure ask a doctor or trainer! The most unattractive size will always be the one that isn't right for you, either too skinny or too big, it goes both ways. Just looked at the link you linked to of "fat" celebrities. In what universe are many of those celebrities considered fat?! Lena, there are people who're naturally 00. They're usually quite short, yet healthy! In Asia and parts of Europe, many women are really that tiny. This article is not meant to be offensive, only to offer perspective on industry standards and women's propensity to make extreme choices. You do realize that size 12 isn't really considered a plus size by stores? In fact, petite size 12 is generally a shorter version of a regular size 10. Do you think that short size 10s are fat? A 5'2" size 12P is definitely over weight by any standard. Weight is proportional based on height. In respect to your individual weight, you are your best judge regarding weight not others opinions. This is the best article I have read in a long time. VERY fair and balanced on both sides. Keep up the great work Bella Petite. Love your radio shows! We do our best to provide content our readers want. Thank you for the positive feedback. Become a Bella Petite MEMBER to help support our efforts! Keep on reading! I am so tired of seeing over weight women. It's sad when you look around at women over 18 and they are totally fat. It's like they don't care about themselves and all they do is make excuses, "I don't want to diet, I don't like working out, I like my sweets, it's to hard to bet fit and so on." Today's obesity rates are a joke and women should be ashamed to be over size 12's at any height. As for the barfing anorexic babes, they need to get a life and seek psychological help and eat some food you too are gross to look at! Get real people nice reality check bellapetite! What does it matter to you what other women do with their bodies? You do not own them, nor do you have any reason to care about the bodies of other people other than wanting them to fit your ideal of beauty. No one should ever be ashamed of their bodies, nor should you wish that on anyone. If anyone should be ashamed, it should be you for being so shallow and for thinking that you have the right to make any sort of judgment about other people based on the shape of their bodies. "The term “full-figured” (size 12 plus) is a feeble attempt at politically correctness. There are lots of size 12 plus women who exercise a lot and eat healthily. Then there are people like my dad, for instance — he is very thin, yet he has high cholesterol (likely due to diet). In short, weight is not an accurate measure of health. True, weight may not always be an accurate judgement for healthiness. The problem is obesity is an epidemic in the United States. Children under 18 are the heaviest they’ve ever been, due to poor eating habits and lack of exercise. Majority of the female population is over a size 12, that’s not healthy or fit by any stretch of the imagination. We can make excuses, but the fact remains few people are overweight due to thyroid or other health issues. A woman that’s a size 12 and she’s 5’2″ she’s fat, if she’s 5’9″ and a size 12 she’s not likely to be considered fat…weight distributes differently according to height. The taller you are the more you can get away with being a larger size. I really wish I could try to work for you! It’s too bad I’m not 18 yet though. I feel as if I’d make a great model for it someday. I’m 4’9 and can generally fit into a size 1-4 depending on the store or brand. This seems like a great place though. Lovely written article too. I enjoyed reading it and it seemed factual.